Same Latitude As Rome came to life in Essex County in early 2007, as a band concept to support the award winning songwriting craft of Peter Boyer. Named after the location of the most southerly point in Canada, inside Point Pelee National Park, Same Latitude As Rome performed throughout Essex County at bars, festivals, charitable events, and Windsor Folk open mikes, and later throughout southern Ontario as audiences grew. The members were drawn from friends and family, and later included professional players drawn from rock, jazz and symphonic backgrounds. Same Latitude As Rome charted at #34 nationally in 2015 with their last release “Early Days”, and appeared on several folk DJ best of 2015 lists, including Album of the Year on Blues and Roots Radio. After a three year hiatus, they’re back! 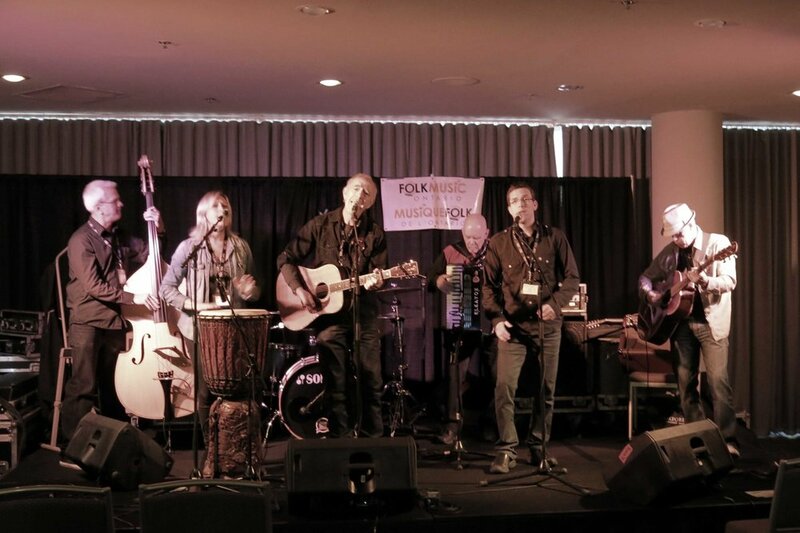 The musicians playing on Stay the Course are among the best in Canada, regularly tour with bigger national artists as back up musicians, and are performers in their own right. They include producer/multi instrumentalist/songwriter JK Gulley, Matt Lima/Tomas Bouda - acoustic bass, Gary Kreller- accordion, Mark Mariash –percussion, and Dale Rivard – dobro. Peter Boyer plays acoustic guitar and harmonica with extra special guest Sean McCann co singing with Peter and playing bodhran on the title song, Stay the Course. Harmonica virtuoso Roly Platt sat in with a bluesy harmonica part on Blue Shelby Mustang. Peter has opened for/performed with/collaborated with many national artists over his music career including: Colleen Peterson, Bruce Cockburn, Dan Aykroyd, Tom Paxton, Sneezy Waters, Ricky Skaggs and Sean McCann. 2. 2008 Ontario Independent Music Award Nomination – Best Folk Album - Which Side of the Line Are You On? Early Days was SLAR’s first CD to chart nationally at #34 in 2015. It appeared on several folk DJ’s best of 2015 lists, and was named the album of the year by Blues and Roots Radio.